It is not too late to join us for the spring season! Come check it out and decide if we are right for you! We are still taking registrations! download the forms and mail them in to the address on the form. All race fees are included in your registration. Our program is open to boys and girls from 7 years old thru eigth grade. We are based in Timonium, but are open to anyone who wants to run. Practice will start on Monday, April 1st. Our season ends in mid June We will meet on the Dulaney HS track at 6:15 PM. We will have practice on Mondays, Wednesdays, Thursdays and Saturdays. Weeknights will be from 6:15 - 7:30, Saturdays will be from 10:00 - 11:15 AM. One night per week and every Saturday is a trail run on one of the local trails. We know you won't be able to make all of those nights every week but we would like your child to attend at least 2 practices per week. We are finalizing the practice schedule with the coaches and the final schedule will be ready on "opening night". Your child should bring/ wear these items to every practice: a water bottle( filled with water! ), running shoes, shorts( it's really hard to run in jeans) and a t-shirt. We plan on running in (3) 5k races this spring. We are still finalizing the schedule. Stay tuned! Our coaches are all former Dulaney HS and/or collegiate runners. Our practice/ training schedule will be a modified version of the training schedule Dulaney uses. Chad Boyle, Dulaney's very successful coach, will be advising the coaches in our program. Our philosophy is pretty simple. We want your kids to have fun. We want your kids to develop a love for running. We want them to improve their fitness levels. You might not believe this, but cross country is a great team sport. The camaraderie between runners is like nothing I have ever seen in sports. 2) Prepare to have fun! Thanks and we will see you on April 1st! The Mighty Milers conquer their toughest challenge yet! Mighty Milers dominate at the ASA Runfest! 7 Nikhil Khosla 13 1:11-14 45:41.3 PR - first 10K! 7 Jack Kodenski 2:11-14 21:06.4 PR! 18 Will Nicusanti 11 3:11-14 22:32.9 PR by over 1 minute! 23 Anna Bibo 9 2 overall 23:31.6 PR by almost 1 minute! 34 Preston Renner 10 3: 1-10 25:14.5 PR by over 30 seconds! 40 Colton Pfeifer 8 5: 1-10 25:55.5 PR by over 30 seconds! 41 Rachel Thornton 11 2:11-14 26:00.7 PR by almost 30 seconds! 44 Lucie Thornton 9 2: 1-10 26:05.7 PR by almost 30 seconds! 50 Jake Weisman 9 6: 1-10 26:31.5 PR by over 2 minutes! 53 Ben Abrams 10 7: 1-10 26:50.3 PR by almost 1 minute! 56 Evan Lyles 9 8: 1-10 27:09.7 PR by over 3 minutes! 68 Lucy Schuler 9 5: 1-10 27:32.2 PR by over 30 seconds! 73 Caroline Thornton 13 6:11-14 27:55.3 PR by over 2 minutes! 76 Emma Carpenter 14 7:11-14 27:58.3 PR - first 5K! 83 Nicole Valekha 9 6: 1-10 28:41.7 PR by almost 2 minutes! 98 Max Murphy 13 10:11-14 29:24.6 PR by over 1 minute! 111 Nixon Pfeifer 6 13: 1-10 30:16.8 PR by over 30 seconds! 115 Zoe Hiemstra 11 11:11-14 31:01.1 PR by over 30 seconds! 129 Timmy Thornton 6 15: 1-10 31:57.7 PR - first 5K! 148 Greta Kent 7 8: 1-10 33:46.5 PR - first 5K! 200 Taha Kantawala 7 21: 1-10 41:47.7 PR - first 5K! 33 Will Nicusanti 11 9:M 1-15 26:10.7 23:21 PR by over 40 seconds! 38 Larsen DeCamp 7 1:F 1-15 26:35.5 23:43 PR by over 2 minutes! 48 Anna Bibo 9 3:F 1-15 27:10.0 24:14:00 PR - first 5K! 82 Colton Pfeifer 8 15:M 1-15 29:34.7 26:23:00 PR by over 1 minute! 83 Rachel Thornton 11 6:F 1-15 29:40.3 26:28:00 PR - first 5K! 84 Brendan Coughlin 10 16:M 1-15 29:40.5 26:28:00 PR by almost 2 minutes! 85 Lucie Thornton 9 7:F 1-15 29:40.9 26:28:00 PR - first 5K! 86 Eleanor Kent 11 8:F 1-15 29:41.1 26:29:00 PR by over 1 minute! 102 Ben Abrams 9 18:M 1-15 31:01.2 27:40:00 PR by over 7 minutes! 121 Jake Weisman 9 20:M 1-15 32:01.4 28:34:00 PR by almost 2 minutes! 156 Caroline Thornton 13 12:F 1-15 34:04.9 30:24:00 PR by over 2 minutes! 161 Max Murphy 13 21:M 1-15 34:20.1 30:38:00 PR - first 5K! 163 Evan Lyles 10 22:M 1-15 34:23.2 30:40:00 PR - first 5K! 168 Nixon Pfeifer 5 23:M 1-15 34:26.2 30:43:00 PR - first 5K! 205 Zoe Hiemstra 11 17:F 1-15 36:06.6 32:12:00 PR - first 5K! 315 Logan Murphy 10 26:M 1-15 43:08.4 38:29:00 PR - first 5K! 369 Jack Stevenson 10 31:M 1-15 48:24.6 43:11:00 PR - first 5K! 388 Muhammed Kantawala 10 33:M 1-15 50:20.5 44:54:00 PR - first 5K! 465 Mia Stevenson 8 27:F 1-15 04:54.0 57:54:00 PR - first 5K! 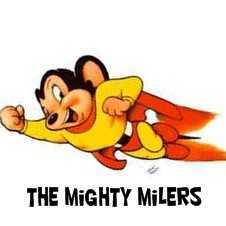 Mighty Milers dominate one more time! 6 Quinten McCarthy 9 1 M 1-10 20:31.5 PR by almost 30 seconds! 7 Brendan Abbott 12 3 M 11-15 20:51.6 PR by over 3 minutes! 11 Brian Hwang 14 5 M 11-15 21:59.8 PR by over 1 minute! 12 Ian Pfeifer 10 2 M 1-10 22:04.5 PR by over 1 minute! 14 Luci Smithberger 11 1 Top Fin 22:21.8 PR, first over-all female in first 5K! 15 Oliver Katz 10 3 M 1-10 22:27.2 PR by over 1 minute! 22 Adam Hudacek 14 6 M 11-15 23:12.0 PR by over 20 seconds! 24 Keegan Clarke 10 1 F 1-10 23:20.3 PR by over 90 seconds! 28 Ryan Tiedemann 13 7 M 11-15 23:37.6 PR by almost 1 minute! 30 Lupine Broekman 10 2 F 1-10 23:42.2 PR! First 5K! 35 Ava Grace Miller 9 3 F 1-10 24:12.5 PR by over 1 minute! 42 Alan Liu 13 8 M 11-15 24:57.3 PR by over 4 minutes! 48 Spencer Davis 11 9 M 11-15 25:20.5 PR! First 5K! 49 Sam Schenck 11 10 M 11-15 25:21.3 PR! First 5K! 54 Joseph Smithberger 9 6 M 1-10 25:42.8 PR! First 5K! 55 Addison Schoch 9 4 F 1-10 25:48.9 PR! First 5K! 57 Larsen DeCamp 7 5 F 1-10 25:53.7 PR! First 5K! 60 Hannah Hersh 12 2 F 11-15 26:07.6 PR by 30 seconds! 61 Meredith Lewandowski 11 3 F 11-15 26:08.7 PR! First 5K! 63 Caleb Glaser 12 11 M 11-15 26:18.4 PR! First 5K! 68 Joe Yared 10 7 M 1-10 26:33.2 PR! First 5K! 69 Amaylia Parraz 11 4 F 11-15 26:36.3 PR! First 5K! 72 Brianna Garofalo 11 5 F 11-15 26:56.6 PR by over 90 seconds! 74 Heidi Giesler 11 6 F 11-15 27:03.5 PR! 79 Ryan Russell 9 9 M 1-10 27:13.6 PR! First 5K! 81 Dylan Nixon 9 10 M 1-10 27:19.8 PR! First 5K! 88 Milou Broekman 8 6 F 1-10 27:58.7 PR! First 5K! 91 Lucy Schuler 8 8 F 1-10 28:08.0 PR by almost 4 minutes! 100 Eleanor Kent 10 11 F 1-10 28:34.2 PR by over 1 minute! 108 Julia Hemler 7 12 F 1-10 28:47.3 PR by almost 1 minute! 113 Selah Glaser 8 13 F 1-10 29:34.9 PR! First 5K! 115 Olivia Perry 12 8 F 11-15 29:56.2 PR by over 90 seconds! 118 Nicole Valekha 8 14 F 1-10 30:02.0 PR by over 3 minutes! 128 Cian Katz 12 18 M 11-15 30:48.8 PR by over 6 minutes! 139 Aubrey Katz 10 14 F 1-10 31:23.4 PR! First 5K! 141 Thomas Coughlin 7 13 M 1-10 31:31.6 PR! First 5K! 145 Nathan Hersh 8 14 M 1-10 31:50.3 PR by almost 3 minutes! 147 Sam de Souza 8 15 M 1-10 31:56.6 PR! First 5K! 148 Johnny Parraz 9 16 M 1-10 32:00.1 PR! First 5K! 171 Brendan Coughlin 10 18 M 1-10 33:49.1 PR! First 5K! 182 Josiah Glaser 10 20 M 1-10 34:56.3 PR! First 5K! 186 Cecilia Holden 11 12 F 11-15 35:24.8 PR! First 5K! 212 Demitri Wuyek 10 23 M 1-10 38:45.1 PR by almost 4 minutes! 22 new PRs at the ASA Runfest 5K! The Mighty Milers spice things up at the Old Bay 5K! Lots of records fall at the ASA 5K! Mighty Milers Gopher it at Goucher 5K! Mighty Milers run fast, Run Wild for Autism! Torrential rain and giant hills can't stop the Mighty Milers at the Wiltondale Overbrook 5K! The Mighty Milers destroy Oregon Ridge in first race of spring! Scary fast times at the ASA 5K and Halloween Hustle! Mighty Milers Run Wild for Autism! Mighty Milers make big noise at the Roar for Autism 5K! In the the girls under 10 age group, the Mighty Milers took the top 4 spots! In the under 10 boys, the Mighty Milers took 4 of the top 5 spots and 7 of the top 10! In the girls 11-15, the Mighty Milers took the top 3 spots and 4 of the top 6 spots! Liam Christopherson       10   M           17  1-10            39:35.1   ( PR - first 5K! Mighty Milers are Awesome in first race of the season! The Mighty Milers finish their season with a great 5K! Lots of PR's and our first sub 20:00 5K! 5 kids dropped over 3 minutes from their best times!!! 6 in the top 10! Everyone in the top 18! Everyone with a new best time! Mighty Milers place 8 in the top 10 at Sparks XC race! The Mighty Milers place all 15 runners in the top 23 at Gilman! The Mighty Milers dominated their age groups! Engel(20:04), in their first races for Dulaney High School. Mighty Milers dominate Loyola race with 7 in top 10! Our spring season starts on April 1st!